1- Hang over “Like Button”, check “Show in News Feed”. 2- Hang over “Like Button”, check “Get Notification” (this is optional, but you should make sure that “Show in News Feed” is checked). 3- Hang over “Like Button”, Add to “Interest List” (this is optional, but to do it: make sure “show in News Feed” is checked, to organize your favorite pages create a list of them by clicking “New List”, add Orange Blossom Water to the list). 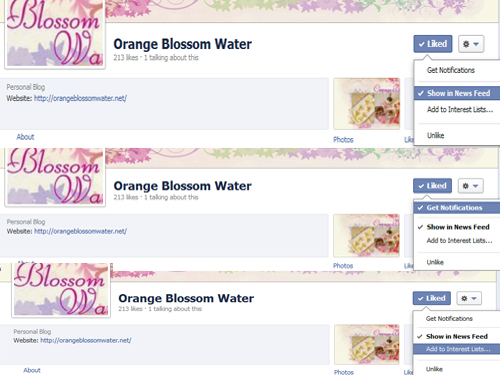 Please share Orange Blossom Water Facebook Page and invite your friends. Thanks everyone. I miss blogging and I miss you all my dear friends, but I can’t update the blog frequently like before, please accept my apology for this. Thanks everyone for lovely emails, I’ll answer them very soon. 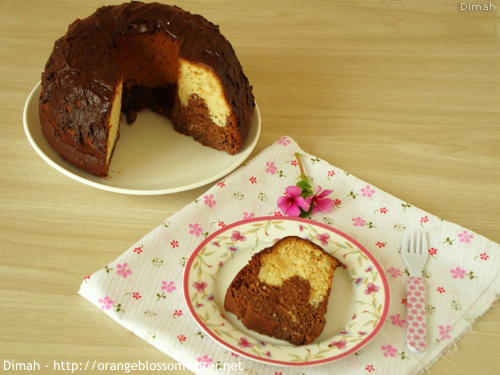 This cake is easy and delicious, I like marble cakes.